These trolleys are used in the manufacturing process of fibre cement sheets. 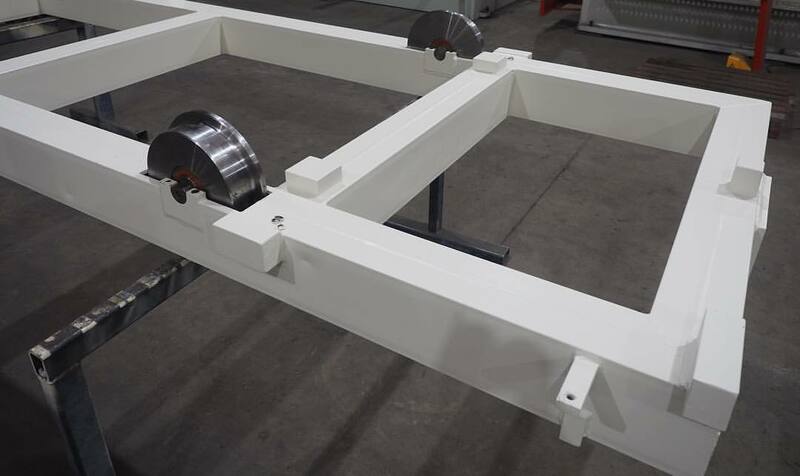 As the freshly formed sheets are separated from their forming roller, they are laid down on a conveyor then transferred to one of these trolleys where a steel plate is placed on top, then another cement sheet follows. These layered sheets are stacked up to about half a meter high on the trolley. Once fully loaded, the trolleys transport the sheets through curing tunnels to the de-piling station where the steel and cement sheets are separated. After that the trolleys are returned to the front of the production line where the stacking process is repeated and the cyclical production process continues. The trolley rolls along rails, and it is drawn by a chain haulage system built under the tracks. Once the stacking process is complete, the trolley it is moved forward, entering a curing tunnel where the cement sheets are cured. After exiting the tunnel further down the line the cement and steel sheets are removed from the trolley. It then traversed over to an adjacent track on which a similar haulage system returns it to the beginning of the line. Fabricated, high strength rigid steel frame made of opposing heavy PFC sections designed to carry a maximum load of 26 tonnes. Heavy duty accurately finished draw blocks to ensure reliable connection to, and disconnection from haulage system. High tensile steel wheels and shafts. Twin sealed deep groove ball bearings for each wheel. Adjustable sensor flags for the triggering of external limit switches. Precision Metal Group was asked to maintain and recondition of trolley built by a third party some 20 years ago. The task was to maintain reliability on the production line. The work involved fully measuring the trolleys, constructing 3D computer models, preparing fully detailed shop drawings. Develop specifications, inspection process and acceptance criteria. Create quality control documents and undertake actual repair and recondition work according to those procedures on a regular basis. This fully integrated maintenance regime resulted in significant improvements to reliability on the customer’s production line.